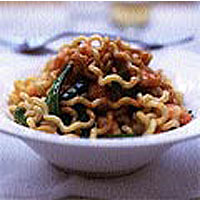 While your fusilli are cooking, pour a little chilli-infused oil into a wok. Briefly cook some peeled prawns, then throw in some mangetout and stir-fry for 30 seconds or so. Drain the pasta, add to the pan and toss. Finish with soy sauce. Halve some cherry tomatoes, cook in a little oil until soft and add some chopped anchovy fillets and a chilli, finely chopped. Toss with cooked spaghetti, season and serve. Stir smoked salmon, dill, capers and sour cream into hot, cooked farfalle and stir to warm through. Season with black pepper and serve (you may want to add a slug of vodka). Sear a salmon fillet in a hot pan then serve on pasta, stirred with rocket and pesto. Garnish with a few halved, grilled cherry tomatoes. Make a pasta salad with cooked pasta, smoked mackerel, and chopped peppers. Dress with mayonnaise mixed with lemon juice and a little horseradish.